Scotland must start reaping the rewards of encouraging competitive performances under Vern Cotter, asserts prop Ryan Grant. The head coach, who extended his contract on Wednesday, guided the Scots to five wins from his first seven games but could not muster a victory in this year's Six Nations. "We as players owe it to ourselves and to everyone else," said Grant. "We need a result and no one's more aware of it than us." Grant featured three times during a campaign in which Scotland often undid themselves through frenetic attack and sloppy individual errors. A sternum injury kept him from Glasgow Warriors' historic Pro12 triumph, but he has been named in Cotter's 25-man squad to face Ireland in Dublin this Saturday as Rugby World Cup preparations heighten. "The Six Nations didn't go well for us a squad, but I didn't get the opportunity to showcase myself and I've picked up a few injuries since then for Glasgow," said Grant. "This will be first time I'm into a game fully fit and I've definitely got a point to prove. "I think we've been guilty in the past of getting frantic after a couple of mistake and things capitulating a bit, but that's almost from boys trying too hard to rescue the situation. "We're a bit more relaxed this time around and we know making a mistake isn't the end of the world and we can flush it and move on. I definitely think we're a better rugby team." 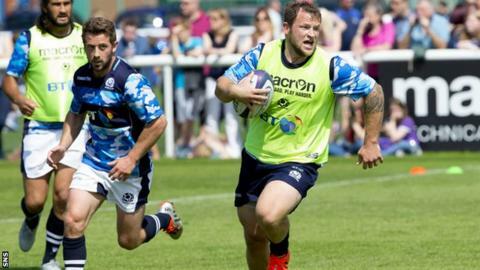 Seven of the 47 in the extended training squad - which will be slimmed down to a final 30 early next month - are props, with Grant vying with club-mate Gordon Reid and Edinburgh's Al Dickinson and Allan Dell for what is likely to be two loosehead berths. "I suppose, because we're here and we've been training together for so long, there is that extra edge," said Grant. "You see what the other guy's doing a bit more often than you would usually. "I don't know if fear's the right word, but there's definitely a drive here that maybe isn't present in any other competition." Fellow Warrior and front-row colleague Jon Welsh faces competition on the other side of the scrum from Yorkshireman Mike Cusack and South African WP Nel, both of whom qualify through residency. Welsh said: "Me, Mike and WP have all got a good relationship, we're all good friends. You get paired into your groups for training and conditioning and Mike's been my partner for most of it and we spur each other on." The squad have been subject to a summer training regime in preparation for the tournament, included a spell in the French Pyrenees, and Welsh appeared before the press looking rather more svelte than in previous seasons. "You've all heard how gruelling the training's been, it's certainly some of the toughest training I've been through," he added. "It's up there with the fittest and strongest I've ever been."